Welcome back. I missed another one, whistling languages. Fortunately a friend heard about them on NPR last month and mentioned it to me. When I searched, I found the topic was in the news a month or so before the NPR story but that the topic was well documented years ago. Why the renewed interest? The reports were triggered by the publication of a new study that's definitely interesting. Still, I suspect the real reason for media attention is the topic itself. It’s fascinating. A whistling language is just that--a spoken language in a different form, whistling. It’s like writing in addition to speaking. Though relatively rare and in some cases gone or dying out, whistling languages are encountered globally--Alaska, Mexico, Brazil, China, Turkey, France, Ethiopia, Canary Islands, Oceania and elsewhere. They arose primarily for communicating over long distances or because of terrain or other causes of isolation, such as dense forest. They’re most common in tonal languages, which cover some 70% of world languages. Whistled tonal languages rely primarily on whistle tone, length, and stress; segmental distinctions of the spoken language are mostly lost. In contrast, whistled atonal languages rely more on articulatory features of speech. Variations in whistle pitch represent variations in timbre, and certain consonants can be pronounced to modify the sound. Whether emulating a tonal or atonal language, all whistled languages convey speech information by varying the frequency of a simple waveform as a function of time, generally with minimal dynamic variations. The research that generated attention was conducted by investigators from Germany’s Ruhr University Bochum and the German Aerospace Center (DLR) Bonn. Earlier research has shown that the brain’s left hemisphere normally handles language processing, including atonal and tonal languages, click consonants, writing and sign languages. The brain’s right hemisphere is specialized to address acoustic properties--spectral cues, pitch, melodic lines, stress and intonation pattern cues. This latest research sought to determine how left and right hemisphere superiorities might change with a whistling language. The investigators focused on whistled Turkish, which uses the full lexical and syntactic information of spoken Turkish. They tested the comprehension of identical information, spoken versus whistled, with whistle-speakers of Northeast Turkey. This was done by delivering speech sounds through headphones to the test participants’ left or right ears. Overall, the participants reported more often perceiving spoken syllables when presented to the right ear (left hemisphere), yet they heard whistled sounds equally well on both sides. In essence, the study showed that whistled Turkish relies on a balanced contribution of the hemispheres; the left because whistled Turkish is indeed a language, the right because understanding a whistled language requires auditory specializations. Although whistling languages were new to me, there’s a wide assortment of reference material--research papers, popular articles, textbooks and videos. Whistling languages might well be pre-historic and were apparently mentioned in 16th century literature if not earlier. 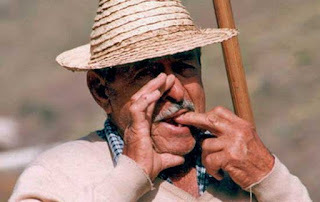 I should note that, although the research reviewed here was on whistling Turkish, whistling Sylbo (or Silbo), the whistled language of the Canary Island La Gomera, was inscribed on UNESCO’s Representative List of the Intangible Cultural Heritage of Humanity in 2009. Sylbo is reportedly the only whistled language that is fully developed and practiced by a large community (more than 22,000 inhabitants). It has been taught in schools since 1999 and is understood by almost all islanders. So, what do you think? Was the media attention due to the topic or the research? Either way, I hope you found the post interesting. Thanks for stopping by.